There are many elements that all work together to create an effective fire door. In addition to the door itself we have fire and smoke seals, hinges, letterplates, locks, air transfer grilles and more. For a fire door to be effective, each of these components have to work together in the event of a fire. If any one element is damaged or not installed correctly it can jeopardise the entire integrity of the door and potentially render it useless in the event of a fire. It’s also important that the different elements are the right fit. There are many different doors, seals, letterplates, locks etc and not all are a perfect match. When looking at sourcing the right fire and smoke seals for your fire door, it’s important to get expert advice to avoid installing the wrong seal for the job. The door itself must be tested and certified with a suitable fire rating. It’s also important that the door is fitted correctly to make sure the gaps between the door leaf and frame are appropriate. Door frames can be made of many different materials and it’s crucial that a fire door frame is made of the correct materials and is compatible with the door leaf. Ensuring it’s securely fitted and the appropriate gap filling materials have been used is also essential. Using the right seals according to the size, specification and material of the fire doors test certification is a must. Smoke seals should fill all gaps around the entire door leaf when closed. Hinges should be fitted with the correct fixings and should also have suitable intumescent hinge pads when being installed. It’s important for the hinges to be attached in the locations as specified by the fire doors test certificate. These should be adjusted to make sure the door closes snugly against the frame while keeping the door easy to use when needed. Door closers should also have ironmongery protection fitted. Compatible locks and/or latches should be fitted with intumescent protection and in the correct location according to the fire door certificate. It’s essential that letterplates used on fire doors are both compatible and fitted by a professional. They require intumescent protection and must be fitted in the right location on the door leaf. When the door is closed the threshold seal should close the gap under the door leaf. The threshold seal should also be suitable to be used with the selected door leaf. This component should be fitted in a factory environment rather than retro fitted. It needs to be compatible with the door leaf, fitting within the size and location specifications as outlined on the fire door certificate. Similar to air transfer grilles, glazed panels should be fitted by professionals in the right environment using intumescent glazing seals. They also need to be compatible with the door leaf and appropriate for the specifications required in the fire for certificate. Fire doors should have clear signage letting people know that they are in fact a fire door and should remain closed (unless automatically operated). When compatible elements of a fire door are fitted correctly it gives them the ability to work together, offering life saving protection should a fire break out. If you have any questions about fire and smoke seals, letter plates or ironmongery protection drop us an email. 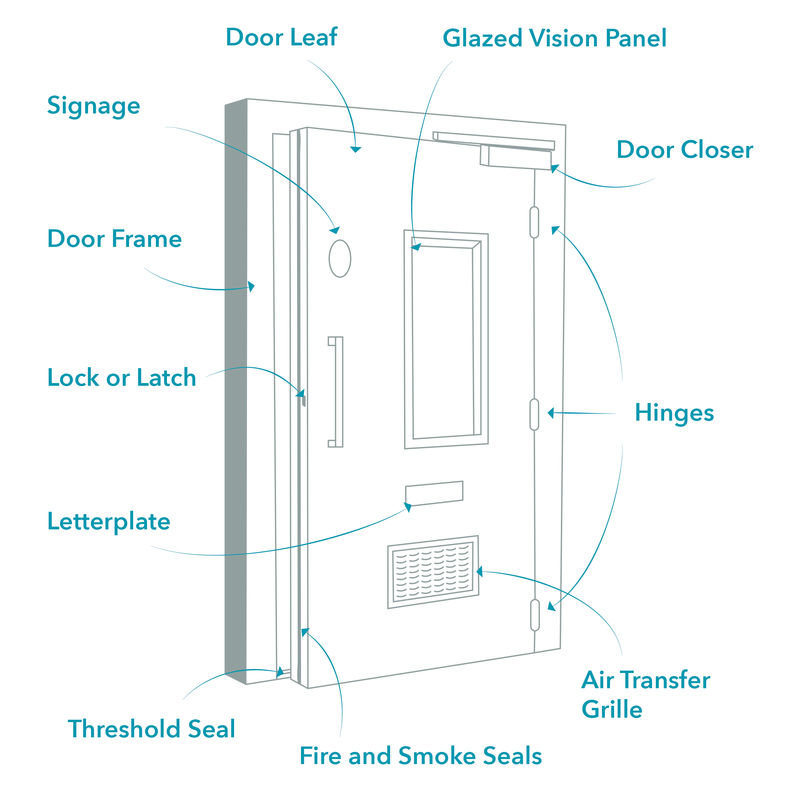 We’d love to demystify these elements for you and help you find the right solutions for your fire door.